Chila: Your short essay, "Switchbacks," is fresh & insightful - I love it! What it tells me is that much can be said and felt in a few short paragraphs. Talk about your writing process here. Alisa: As I played back the memory like a film, the first line came to me. The rest tumbled after: I heard the rhythms, and the words followed. When the work comes as a song or cadence it is much harder to keep the rhythm intact when editing, but I was able to edit later, just to clarify. I am always astonished and grateful when I first hear the words, either before or as I write. Sometimes I hear titles or phrases in dreams, but the next work almost always begins with a walk. I walk every day, which shakes out a lot of writing. It would be interesting to see if my writing rhythm matches my walking pace. Chila: The best essays contain at least some humor, some lightness, in my opinion, just as you've done at the end of "Switchbacks." Life can be way too heavy. Do you find this to be the case? Do you often include glimpses of humor in your work? Alisa: The problem with humor is that people just don’t take it seriously. Chila: Ha! So brilliant ... Talk about your work at Star 82 Review. How specifically does editing a literary venue help you as a writer? Alisa: I see everything not to do. It’s amazing how many of the same story I read each month. This, of course, makes me self-conscious and encourages me to stretch more. Reach for new subjects, fresh metaphors, snappy dialogue, unusual interactions. And to base the story on a strong emotional core while leaving judgment up to the reader. Just pulling imaginative stuff out of my head and lining it up in a pleasing or amusing form isn’t enough. There also has to be a point without it looking like a lesson. Alisa: You would think that most writers love words, but from all the stories and poems I read, that does not seem to be the case! Words are the raw materials and need to be carefully chosen. Each one has layers of meaning. Sounds have associations for us as well. To get to the lyrical quality, writers must read their work out loud and listen. Beyond the meaning, the sounds are important for the flow; the right arrangement of words, sentences, and paragraphs has the potential for lyricism. If my tongue trips, or if the breath seems out of place, or the sentence feels bumpy, I will rewrite. There is something natural about lyrical writing that can be found in listening, in breathing, in waves and wind. Length of words, lengths of sentences can punctuate a mood. I can’t always get at the melody, but I try at least for the rhythm. In the past, I only wrote while listening to music, primarily music with lyrics. I’d mishear phrases and those would start a new poem for me. Chila: What's up next for you creativity-wise? Alisa Golden writes, makes art, and teaches bookmaking and letterpress printing at California College of the Arts in Oakland. She founded and edits Star 82 Review, and her prose and poetry have been published in 100 Word Story, Dead Housekeeping, NANO Fiction, and DIAGRAM, among others. 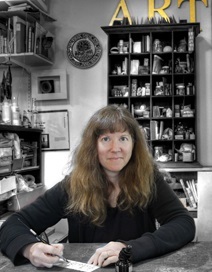 She is the author of Making Handmade Books and lives in Albany, California. www.neverbook.com.